Soaking in a great race! 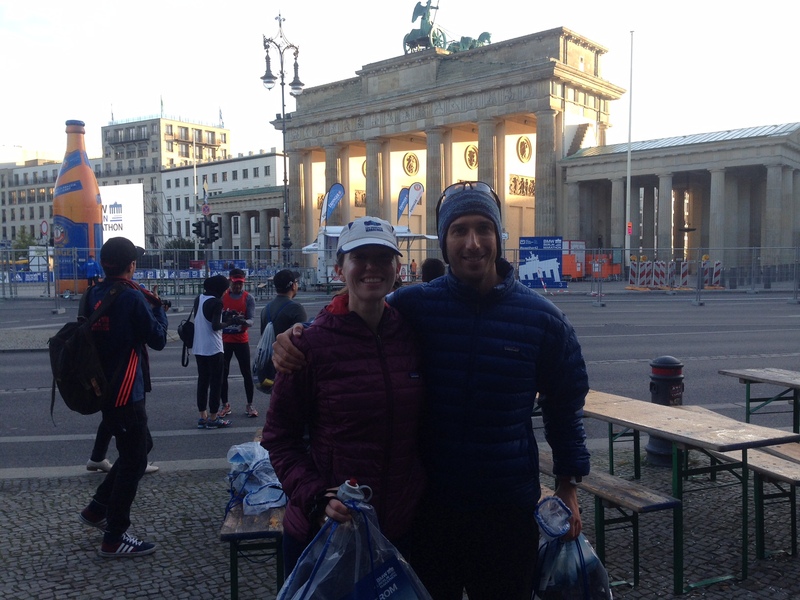 The Berlin Marathon was years in the making. 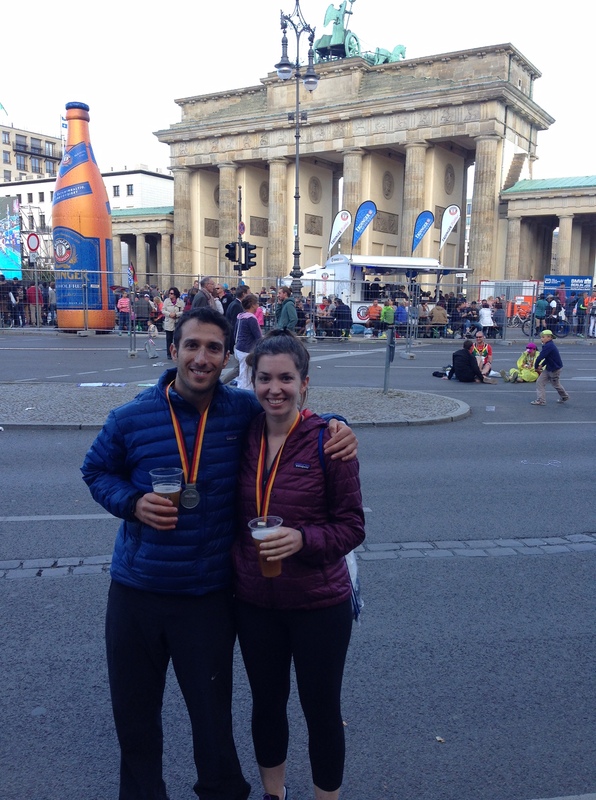 Like many other runners, I one day aspire to tick off all six majors, and my dream scenario for Berlin was a combination of the race and Oktoberfest to celebrate my 30th birthday (September 15th). The planning stages kicked into high gear around this time last year when the 2015 lottery opened. Taylor, my sister, her fiancé and I all put our names in the hat, but much to our dismay, we all came up empty handed. Without hesitation, Taylor and I secured a race entry through Marathon Tours – an organization that specializes in race travel. The process was straightforward – we paid slightly more than we’d budgeted for a stay at a nice hotel within steps of the start/finish, and in return, we received a coveted race entry at face value. The plan was in motion, and in the coming months, we booked an amazing itinerary that included Berlin, Oktoberfest in Munich, Paris, and Iceland. 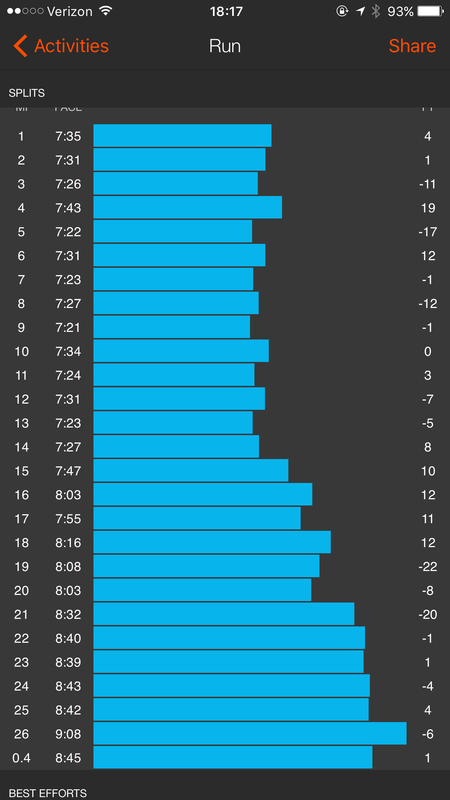 As some of you may recall, after running North Face 50 miler last December, I took my best stab at running a PR half marathon at Kaiser Permanente Half in early February on roughly 3 weeks of consistent speed training. Although I fell short of my (ambitious) goal of breaking 1:30, I did PR with a 1:34 – including 10 miles in 1:09 before the wheels fell off. With Kaiser as my benchmark, I drove into race training head first, and aspired to run at least a sub 3:20 in Berlin along with a sub 5 hour half ironman at Vineman in July. Two weeks later, I broke my foot, and ultimately spent 10 weeks off my feet entirely, not to mention almost 4 months away from consistent running. Frankly, I was crushed. After a solid 4 years of consistency and improvement, I was stopped dead in my tracks, and had to adjust my expectations for 2015. When it came time to resume activity, I took it one week at a time, remained patient, and did the most I could without being reckless. My PT was smooth, the bone healed nicely, and I was back to consistent running by mid-June. There were some amazing results along the way – 4 podiums, and a significant improvement to my swim and bike legs, however my speed was lagging behind. I ran a lot of hills on the trail, did short speed workouts, and slower long runs on the weekend. The real test was our last long run before Berlin: Taylor and I ran a hilly route from San Francisco over the Golden Gate Bridge to Tiburon – 20 miles with ~1200’ of elevation gain on the road. I held a 8:25 pace without overexerting – exactly 30 seconds off my last road marathon pace, and felt good about my chances. I opted to race a half Ironman (Santa Cruz 70.3, race recap coming soon!) the following weekend – not to PR, but to get in one last long workout two weeks before the race. My swim and bike volume was very high leading up to the marathon, and I decided that the half wouldn’t be overkill as long as I paced well. 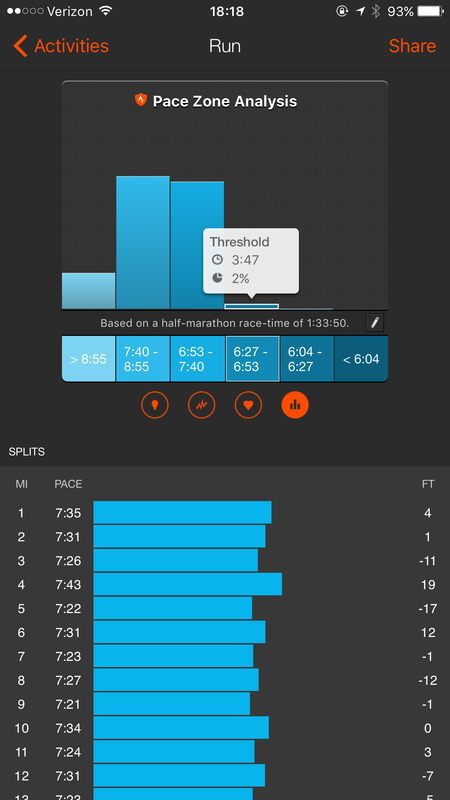 I did pace well, and set a 70.3 PRdby 8 minutes, comfortably logging a 1:46 half marathon – a 13 minute improvement from my second best 70.3 run time. I was race ready for Berlin. When Taylor and I touched down in Berlin, we were beyond stoked. Admittedly, it was hard to be on our best behavior for the first couple days of an amazing vacation, but we held back knowing that it would be much sweeter after the race. We spent the first two days walking around and doing some light sightseeing to shakeout our legs. We leveraged the hotel gym for stretching and foam rolling, ate meals similar to what we’re accustomed to back home, and avoided German beer! 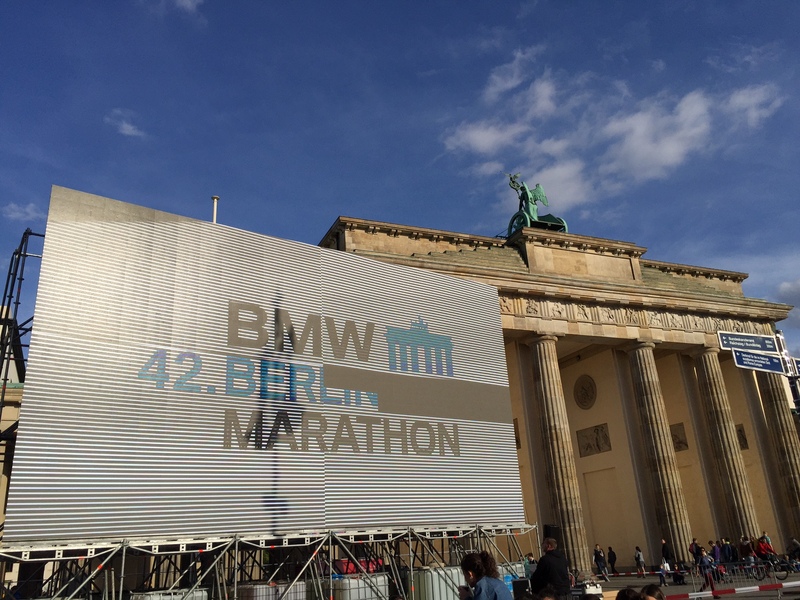 The hype was building quickly – the finish area around the Brandenburg Gate gave me chills, runners from all over the world started to take over the city, and the weather was absolutely perfect – ~55 and sunny with barely any wind. The finish area under construction. After a braving the expo, getting a couple nights of good sleep, and nailing the taper, it was time. As I mentioned before the race, my A-goal was a PR – sub 3:29, but I felt that I could beat if I executed properly. In my shakeout run the day before the race, I felt so comfortable and confident at a 7:30 pace that I decided I was going to give it my all and go for an aggressive time. The starting area was a zoo. I’ve run NYC, and this was utter chaos in comparison – a throng of 40k+ runners migrated from the large lawn in front of the Reichstag to their corrals in a matter of minutes, and there were some serious bottlenecks. Although I was part of wave 1 (elite-3:30 official finish times) I was quite far back, and knew I would be dodging people for miles – just like NYC. When the gun went off, I felt a wave of adrenaline that I hadn’t felt in years. I was bouncing with every step and my form felt great. I was holding back, but still ticking away high 7:30s to start, and it didn’t feel overly aggressive. It was a balmy 39 when the gun went off, but it warmed up quickly. The crowd was incredible. I was listening to music in an attempt to keep my tempo high, but it was almost futile: between the roar of the spectators, live bands, and words of encouragement, it was the most energy I’ve experienced at a race. The course was also incredible. Between the immaculate road quality with little to no camber and the gratuitous flat/slight downhill sections, Berlin is a true PR course, and I think that the volume of runners are really the only hindrance. The first hour was relatively uneventful in a good way. I hit the hour mark with exactly 8 miles down – well below PR pace, and showed no signs of slowing down. 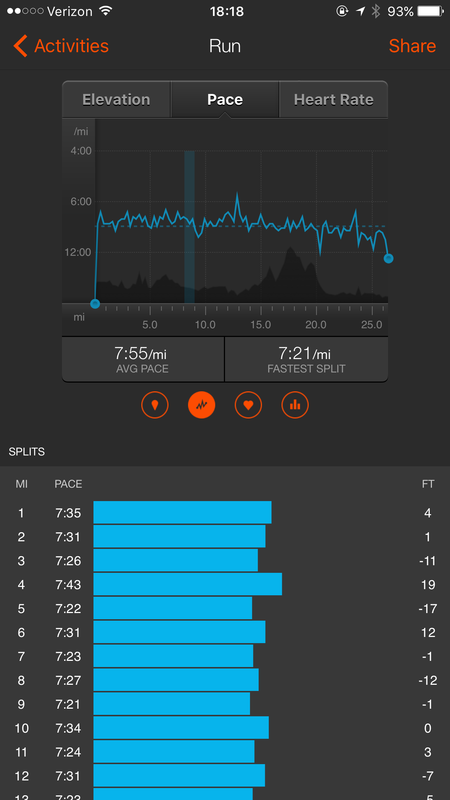 My miles were creeping closer to the 7:20s, and I dipped into the 7:20s several times by the 13.1 mark. I hit the 13.1 spit in just over 1:37, and my confidence was surging. 2 hours and 16 miles later, I felt pain over my fracture site. It wasn’t entirely surprising, but disconcerting nonetheless – this was my first long, hard road run in almost a year and I was bound to feel the lingering effects of my injury in some capacity. I won’t say that I hit a wall around mile 17 – my pace didn’t plummet, but I was in serious danger of a blowup if I didn’t slow down. Instead of trying for a walk break, I decided that the best course of action would be to slow to a comfortable pace – closer to 8-8:10 minute miles – just like I did at Ironman Santa Cruz 2 weeks prior. That worked like a charm: although I was gritting my teeth, I was able to hold on for dear life. With a mile left, I knew that I was in really good shape for a PR, however the only question would be the official time – there was no question that I’d log more than 26.2 miles due to the weaving through crowds and my inability to cut the ideal line. When the Brandenburg Gate was in sight, I dug deep for one last pickup. 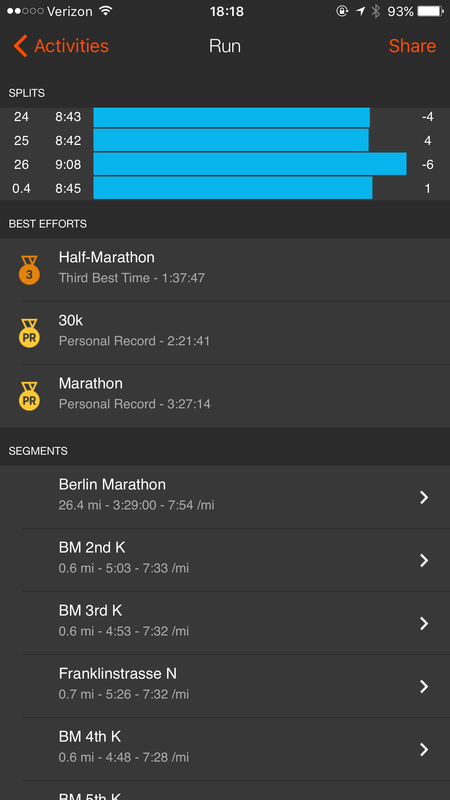 When I hit the marathon mark on my Garmin, I was ecstatic to see a 3:26 on the watch, but it wasn’t over yet. I surged to the finish line and was at the absolute end of my rope when I crossed – I later found out that I ran a 3:29:00 exactly – a 30+ second PR to cap off my recovery! I gave it my all – I can safely say that I had nothing left in the tank when I finished, and I can’t say that about every race. I felt delirious, had to lay down, and consumed liquid calories until I came back to life; I almost took myself to the medical tent for an IV. When I came to, I had a huge smile on my face and was overcome with joy after soaking in the gravity of the accomplishment. It wasn’t the sub 3:20 I envisioned, it wasn’t a huge PR, but improving on a PR that I set when I was in the best running shape of my life despite the adversity that’s come my way this year left me elated and full of optimism. I have two more major races on the calendar this year, and they’re big ones: Rio Del Lago 100 Mile and North Face 50 Mile. I logged 24 miles and almost 7000 feet of climbing this weekend (6/1400′ on Saturday, 18/5200′ on Sunday) and I’m planning to do another back to back next weekend (~7 miles, 50k); that will be the final litmus test for my 100 mile fitness. I don’t have any expectations for the 100. I do think that I could finish if everything goes to plan, but if I don’t, I’m near certain that I’ll log my longest run (> 54m) to date on November 7th. Simply toeing the line will be a win after everything that’s transpired this year; on to the next one! Congratulations on a great race! It sounds like you really gave it your all and to come out with a PR must be SO satisfying 🙂 What is the next challenge for you? 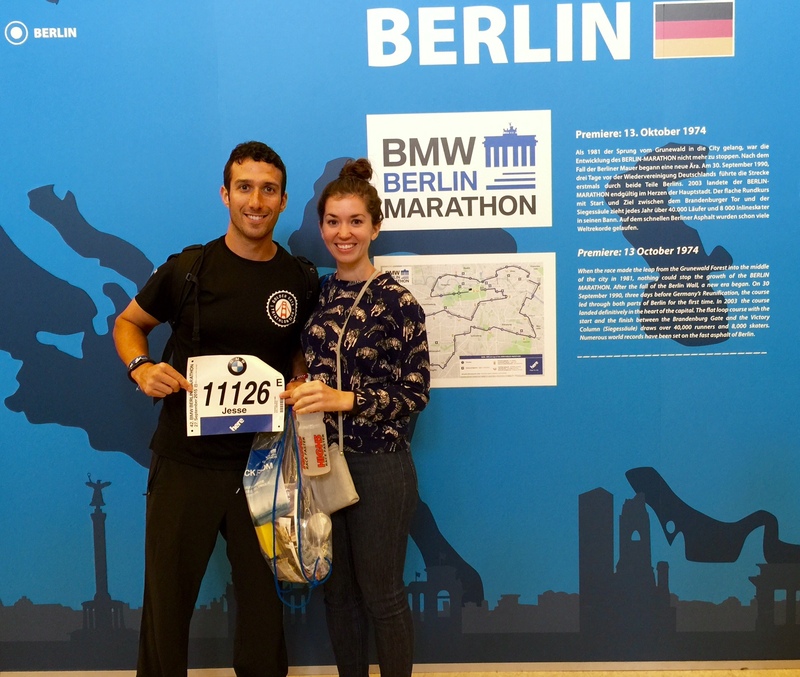 You’ve definitely inspired me to put Berlin marathon on my to-do list! Congratulations on a great race, and nailing a PR! The fact that you got such a good time even though you slowed down significantly toward the end means you were really cruising in the beginning. Good for you going the smart/safe route and I’m glad it paid off for you in the end. It sounds like you guys had an amazing vacation and I’m so glad you enjoyed every minute of it! Sometimes I’m amazed how much racing you two can cram into a year. a marathon, 50 miler, and 100 miler over the course of 3 months?! Holy crap! What a comeback, and what an awesome race!! So jealous that you got to run it. Can’t wait to do it sometime myself. I think I started following you shortly after you returned to your normal activities from your foot injury. I can’t BELIEVE how far you’ve come since then – and to run such an awesome marathon PR! I need that surge of confidence in my next marathon to take me to the next level. I ran one on Saturday – started too fast, felt strong through the finish but no PR for me. Oh well! Your recap is so motivating! Congrats Jesse! What an amazing accomplishment after going through a crazy year. You killed it out there and I have no doubt you’ll keep improving quickly as the rest of the year goes on. Great job! That’s so exciting to come back from such a big setback earlier this year. Great job! Congrats. What a great run! I was just telling Rock that these big races drive me nuts because of the chaos at the beginning. Regardless of how organized they might be, I think the weaving is just part of the game. Congrats on healing so well and giving it a heck of a go. You definitely deserve that PR. Congrats on the PR! That marathon and the trip sound like such an amazing experience! Congratulations on eeking out that PR! You must have passed me around 40k because I finished in 3:31 and started much too fast … somewhere around downtown Berlin you must have comfortably breezed my me. Sounds like you could have gone much faster if your fracture site hadn’t started to aggravate you. But that WHAT IF will be for another time. Sounds like you have plenty of races to look forward to for the rest of the year. Good luck! What an awesome race!! Great recap and nice job on the PR!! A PR is a PR!!! Congrats!!! I’ve entered the lottery for Berlin 2016. Had heard that for folks abroad it’s pretty much a sure thing to get in through the lottery, that is, until I read this blog. Yikes, now I’m not so sure. Congrats on an amazing race! Fingers crossed! If it doesn’t work out, the tour groups are a viable option, and we had an amazing experience! We’ll see, right? Drawing in a few weeks. Plenty of time for a Plan B.